Why is Brain Gym transformational for reading? How can I bring Brain Gym to my school? 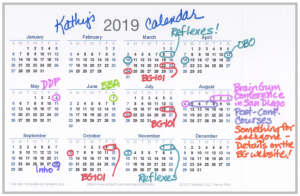 Kathy Brown offers a wide variety of courses and workshops covering various topics relating to Brain Gym® tools and techniques. A former classroom educator (23 years teaching K-6), she shares a wealth of knowledge about how to understand learning challenges as they manifest in the classroom, and offers practical ways to use Brain Gym activities throughout the day. Perfect for a school in-service training day. As a skilled trainer with 20 years’ experience educating adults, she also dynamically shares how these tools can be used to address the issues in the business world, stress management, and personal growth topics. Brain Gym introductory workshops can be tailored to meet specific needs. Here are some examples of schools and agencies that have benefited from one of Kathy Brown’s in-service workshop on Brain Gym. Brain Gym® International Conference – “I’m Smarter Standing Up” – Release STNR and Increase Focus! Main points: one key developmental issue that keeps children from being able to sit still – Symmetrical Tonic Neck Reflex (STNR) – and what to do about it. 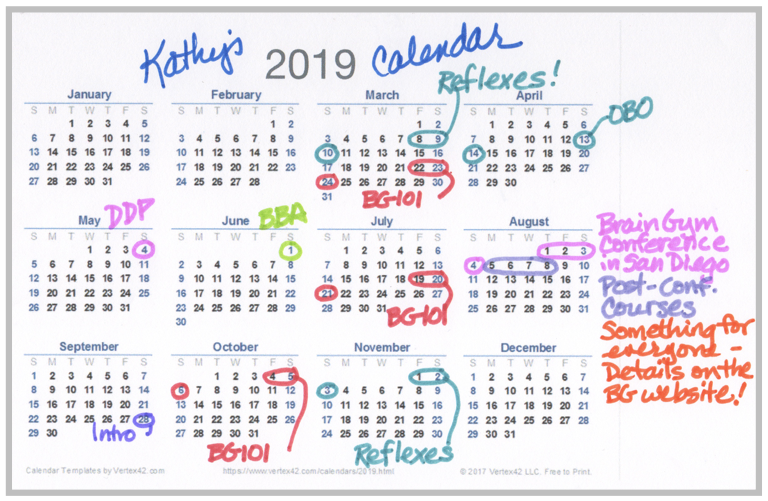 Learn about the impact in one’s life if this reflex is still active, experience pre-checks that identify the presence of this reflex in a child’s nervous system, and learn the protocols that are very beneficial in supporting it in thorough integration. This blog article illustrates resolving the STNR. Central Consolidated School District, Shiprock, New Mexico – Full day workshop for teachers of the healthy pregnancy program, and infant through pre-kindergarten children. Main points: Four key developmental movement stages of the infant, how their complete development leads to mature, integrated movement patterns and therefore cognitive ability, common practices that impede full development, and specific actions that can be taken to encourage full development. Six key infant reflexes, how to know if they are “retained” past infancy, what specific cognitive and behavioral challenges result (i.e., lack of coordination, learning disabilities), and how Brain Gym activities help move children of all ages smoothly through the infant reflex continuum, supporting true learning readiness. Arizona Department of Education “Early Learning Institute” – Two half-day workshops for groups of 80 early-grade educators. Main points: basic Brain Gym movements and how they support the developing neural system of the young child; how lack of specific kinds of developmental movement affects eye teaming and success as a reader, and how Brain Gym movements can help; how retained infant reflexes impair a child’s ability to learn easily and naturally, and how movement helps overcome these blocks; methods of incorporating playful elements of Brain Gym movements into every class day; personal experience of the fun of movement, and how we are more effective learners after experiencing the integration of movement. Creighton School District – Full day of instruction for ten P.E. teachers who work with children in grades K through 8. Main points: how to incorporate key Brain Gym movements into P.E. activities; experience how Brain Gym movements boost sports performance; experience direct correlation between physical coordination and “academic agility” in learners; how the P.E. program can support brain function and therefore academic excellence. Sierra Vista, Arizona: Village Meadows School – Two half-day workshops on the basics of Brain Gym for K-6 teachers and aides, followed by a Residency Day, a full day of demonstrating the use of Brain Gym with individual students in a school setting. Main points: the use of specific Brain Gym movements to directly address challenges in focus, organization, and attention; the relationship between body coordination and reading/math/handwriting ability, and how to improve both coordination and academic skills simultaneously, through the use of simple Brain Gym movements. Therapy Rehab Services – Two-hour workshop for occupational and physical therapists employed by a contract agency that provides services to many local elementary schools. Main points: Developmental issues behind the challenges that OT’s and PT’s are asked to remediate; how Brain Gym movements and processes can help children with developmental challenges to become more ready to benefit from typical OT and PT remediations. Queen Creek, Arizona: Walker Butte Elementary School – Full-day workshop for 25 teachers of K-8. Main points: Typical issues experienced by “challenged” learners, and their direct correlation to lack of communication between specific brain structures; the use of specific Brain Gym movements to develop and maintain full communication between all brain structures; specific eye-teaming challenges of learners who do not read easily and why specific Brain Gym movements help them; how to introduce Brain Gym movements to learners of all ages to generate interest and promote their use as a personal self-management tool. Phoenix Unified School District – Half-day workshop for 15 literacy coaches. Main points: The mechanics of literacy (symbol recognition and decoding, eye tracking, comprehension, focus, etc.) and how each element can be improved through the use of Brain Gym movements; understanding need for communication between specific structures of the brain, how stress can inhibit this communication, and how Brain Gym movements can release stress and help us return to whole-brain functioning; how to determine if a learner leads with his/her left or right eye, the implications of “left-eye lead” on ability to scan a line of print (left to right), and how Brain Gym movements resolve that challenge by helping both hemispheres communicate with each other more fully, promoting more effective eye teaming and left-right tracking. Phoenix MENSA Conference – Break-out session at the state-wide conference. Main points: Noticing how cross-hemisphere brain organization, as evidenced by skill in bilateral drawing (the “Double Doodle” movement from Brain Gym), can be enhanced through using additional specific Brain Gym movements. Course participants all noticed improvements in simultaneous control of their two hands, the ability to produce a satisfying mirror-image design on paper using crayons and markers, and level of enjoyment and playfulness as they engaged in this activity! Brain Injury Alliance state-wide conference for TBI survivors, their families & caregivers – Break-out session focused on “Brain Gym as Practical Application of the Brain Plasticity concept.” Main points: how specific Brain Gym movements activate latent potential and develop new neural patterns. Experiencing how specific movements improve focus, personal awareness, physical balance, coordinated physical movement, and more. Note: Kathy has been a provider of twice-monthly open-group Brain Gym sessions at the Brain Injury Alliance. Click here to read the story of a participant who experienced a profound change in a single group session. Scottsdale Ranch Women’s Association – Moving Confidently As We Age – Main points: How the Brain Gym warm-up called “PACE” can support us all in maintaining focus, memory, postural stability, and confident movement. of what’s going on behind the problems my students have in school. Please contact our office for information on pricing for in-service workshops and presentations. Our goal is to provide the right workshop, to the right group, for the right reasons, and at a rate that meets everyone’s needs. … to explore the possibilities! © Copyright Kathy Brown 2019. All rights reserved. All photographs other than instructor portrait images ©Copyright Laird Brown Photography. All rights reserved. Please visit the Brain Gym® website at www.braingym.org.